ARE YOU USING THE RIGHT VALVE? There are two main types of valves for passenger cars and vans. The valves are designed for different maximum pressures! Rubber valves are available in two versions: the standard rubber valve, which can cope with a pressure of max 450 kPa, and the high-pressure rubber valve, which can cope with max 700 kPa. 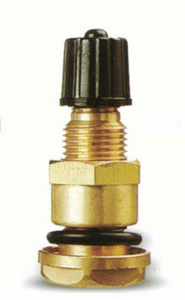 The metal valve can take a pressure of max. 1400 kPa. If the vehicle has a recommended tyre pressure close to 450 kPa or more, there is a risk that the vehicle owner will fill them to a higher pressure. Tyre pressure also goes up when the tyre gets hot. In these cases, a standard rubber valve should not be used, but instead a high-pressure valve or metal valve should be chosen. This problem is not uncommon on mobile homes and caravans! We strongly recommend using a metal valve at speeds over 210 km/h. There is a high risk of rubber valves bending at high speeds, with ensuing air leakage.